The Pound enjoyed another rally as U.K Retail Sales figures printed a lot higher than expected. The year on year Retail Sales figure printed at 3.3% compared to the expected 2.3% number. This comes after Wednesday's better than expected U.K inflation data with both sets of data raising chances of a sooner than expected rate hike from the BoE. Additionally, the rally was supported by a decrease in demand for the safe haven U.S Dollar as risk on sentiment returned to the market following the less aggressive trade war stance from the U.S and China. For today, the pair will be driven by the greenback as both the U.S Manufacturing PMI and Services PMI are set to be released. The Pound broke above the 1.32258 resistance level following the better than expected U.K Retail Sales figures. 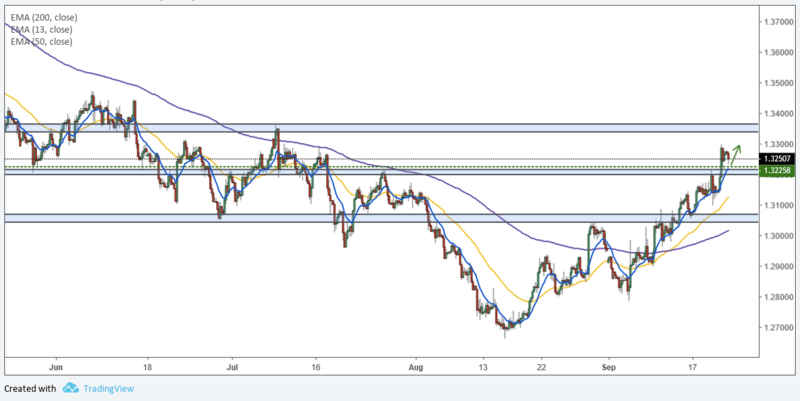 The break above this key resistance level signals that the pair will continue its upwards trend and rise towards the next resistance level at 1.33330.